"A simple reading assignment turned into a one-hundred-fold act of kindness for a local group of young students. Fifth-grade students at Oak Street Elementary School decided last fall to send words of encouragement to lawmakers who work at the Statehouse. Each of the 100 “kindness letters” contains an inspiring quote hand-written by a student. "Just before sunset Thursday, Mark Rhodes helped his 10-year-old son, Neil, lace up his skates at the town’s outdoor skating rink at Carrigan Park. “As soon as I get home from work he says, “Dad let’s go,’” Rhodes said. Word of the rink opening is spreading around town. Neil brought a hockey stick that he got about a year ago. "J.P. and Melynda Gallagher are brewing up something special for downtown. 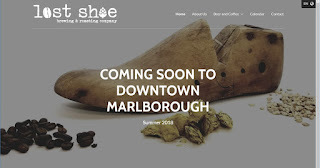 Lost Shoe Brewing and Roasting Company is expected to open this summer in the former Speakers nightclub at 19 Weed St., J.P. Gallagher said on Thursday. “We always wanted to be in Marlborough, both my wife and I were born and raised in Marlborough,” said Gallagher. Lost Shoe will be more than a brewery. It will also be a coffee roaster and coffee shop. J.P. Gallagher has been a long time homebrewer and recently graduated from the American Brewers Guild in Vermont. His wife Melynda recently completed a coffee roasting course at the Coffee Lab International School of Coffee, also in Vermont. The idea is to be an all-day business – Lost Shoe will open at 8 a.m. to serve coffee and the brewery will begin serving beer later in the day."